About a month ago I posted about my garden in The Gardening Life. All I have is a cluster of succulents and one tomato. No, my garden isn’t huge or really even a garden but I’m new to Arizona gardening so I thought I should start small. Succulents do great in Arizona and mine are hanging in there just fine. I mean come on, you water them once a week – even I can’t kill that. Apparently what I can kill is my one little tomato. My beautiful green little tomato just trucking right along! Gorgeous, huh? When it started turning orange and then red I got so excited. I was so proud! It was my a baby taking his first steps. It was big – I had managed not to kill it! Red? Yes. Bigger? Yes. Plump and juicy and ready to eat? Not so much. So how do you kill a tomato? Easy. 1 – Don’t water it every day. 2 – Let it dry out in the Arizona heat. 3 – Go ahead and let the little buggies eat it. I learned just last night that tomatoes can be sort of finicky so you should water them at about the same time everyday. 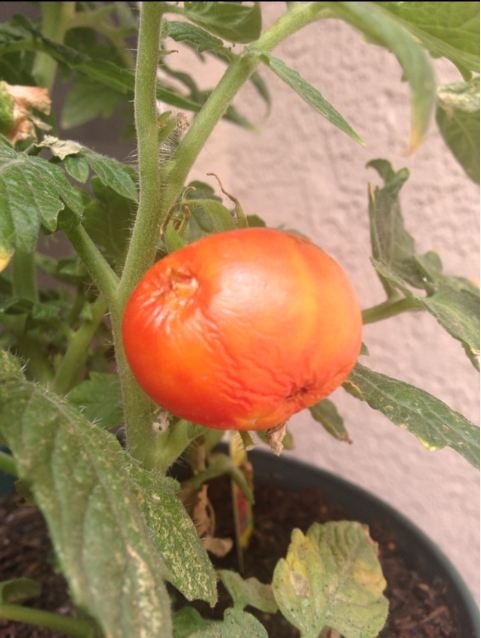 I’ll admit that I didn’t even water my tomato every day – let alone at the same. Maybe I’m not cut out for an Arizona garden. In North Carolina I felt like if you missed a day of watering it was alright because it took about that long for the soil to dry out anyways. Here it takes about half that time and I’m sure my tomato hates me for it. Despite my sad little garden experience, I plan on trying again next year! Maybe before the summer sets in. Any tips would be appreciated! That’s life with Mr.Layland & Me!